Easy ePrivacy compliance for website operators. Cybot delivers automated ePrivacy services that enable website operators to respect and protect the privacy of their visitors. By bringing ePrivacy to the Internet Community, websites earn both consumer trust and compliance with legal regulations - both increasingly competitive fundamentals in the digital economy. Cybot operates from the cloud only. This ensures you an easy-to-implement, low-cost and highly scalable solution. 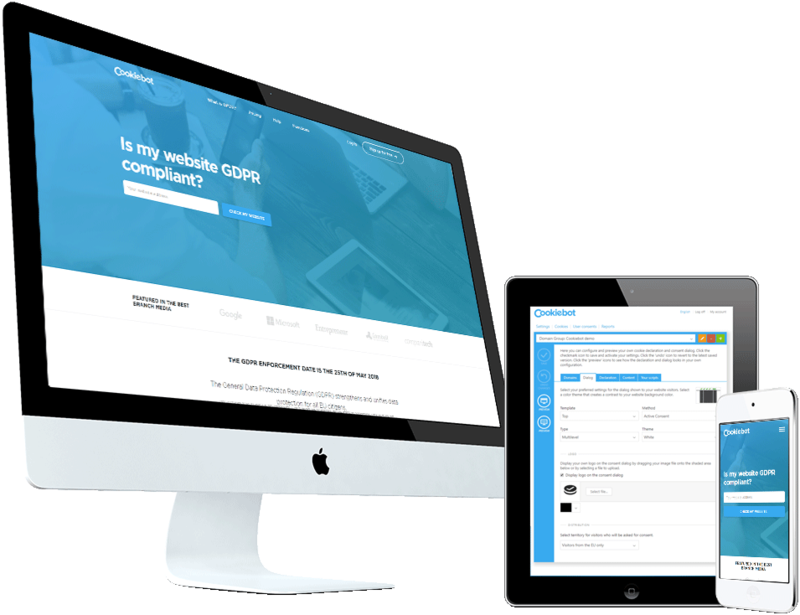 Cookiebot enables website operators to comply with the information, documentation and consent requirements regarding online tracking of the EU ePrivacy Regulation (ePR) and General Data Protection Regulation (GDPR). Cookiebot delivers a user friendly and highly efficient consent mechanism that is easy to implement on any website. An automated cookie scanner continuously analyzes all content on the website and produces a cookie audit report with comprehensive descriptions of cookies and similar tracking technologies in use on the site. We believe that Cookiebot will contribute to a higher level of consumer trust in the digital economy.